The Brighton Oratory is an Orthodox Catholic faith community of ordinary people diverse in age, background, experience and talents who are committed to deepening their spirituality in, through and with the love of God expressed in the life and teachings of Jesus Christ modelled on the experience of the Apostles and the Early Church described in Acts 2:42-47. As a community we seek to welcome everyone, especially the poor and disenfranchised, whether in spirit or in love. We are simply a faith community seeking to encourage, support and develop individually and together our spirituality and understanding of the Divine, that we may experience both in this life and the next, the Kingdom of God in us. This week is Quinquagesima, one of the names used in the Western tradition for the Sunday before Ash Wednesday. It is also called Quinquagesima Sunday, Quinquagesimae, Estomihi, Shrove Sunday, or the Sunday next before Lent. It is 50 days before Easter, hence ‘quinquagesima’, or ‘fiftieth’. In Sunday’s Gospel the seeing are blind, while the one who is blind can see (Luke 18:31–43). Jesus tells the twelve that He is going up to Jerusalem to suffer and die and rise again, but they cannot understand or grasp what He is saying. The meaning of His words is hidden from their sight. However, as Jesus makes His way up to Jerusalem, a blind man calls out to Him for mercy. This blind man sees that Jesus is the Messiah, the Savior, for he calls Him “Son of David.” Indeed, Jesus is the Lord’s anointed, the keeper of sheep (1 Sam. 16:1–13) who goes to lay down His life for the sheep. He is the incarnate love of the Father who suffers long and is kind, who is not puffed up, who never fails us (1 Cor. 13:1–13). Jesus opens the eyes of the blind (Is. 35:3–7) to see Him not according to outward appearances of lowliness, but according to His heart of mercy and compassion. Those who behold Him thus by faith follow Him to the cross through death into life. MASS please note the new times of daily Masses this week. Ref broadcasting: we’ve had some technical issues which we hope are resolved! FATHER GEORGE von Abel is looking to move to Brighton & Hove to begin assisting in our Mission’s ministry. To do this, Father needs a new job and a new home! Please keep your eyes peeled for management or supervisor roles in hotels or restaurants locally. Please forward details of any potentially suitable positions via email here. Remember that our priests are bi-vocational and generally need financially to support themselves. VACATION please note that Fr Jerome will be away from March 7 to 21 on pilgrimage to Ephesus where St Timothy was bishop, St John and the Blessed Virgin Mary resided and he’ll be revisiting the tomb of the Apostle Philip at Hierapolis. There will be no public Masses during this period. TENTMAKING SERIES in preparation for our missionary endeavour later this year, the Provost is publishing a series of articles about mission. Please do read them and continue to pray and think about how we can spread the Good News to our friends and family in Brighton & Hove! These reflections are also the basis for our Lenten discussions on Thursdays (see below). HOLY HOUR THIS Thursday and every Thursday in Lent (Thursdays the 9th and 16th of March), open to our ecumenical friends in Churches Together, a meditative service from 5-6pm in the Chapel at Brighton Congress Hall. This will be a reflective service by candlelight affording the opportunity to “sit and be still” in the presence of The Lord. LENTEN OBSERVANCE The focus of this Season is the Cross and penance, penance, penance as we imitate Christ’s forty days of fasting, like Moses and Elias before Him, and await the triumph of Easter. We fast (see below), abstain, mortify the flesh, give alms, and think more of charitable works. Awakening each morning with the thought, “How might I make amends for my sins? How can I serve God in a reparative way? How can I serve others today?” is the attitude to have. Because of the focus on penance and reparation, it is traditional to make sure we go to Confession at least once during this Season to fulfill the precept of the Church that we go to Confession at least once a year, and receive the Eucharist at least once a year during Eastertide. In addition to mortification and charity, seeing and living Lent as a forty day spiritual retreat is a good thing to do. Spiritual reading should be engaged in (over and above one’s regular Lectio Divina i.e. Bible study) e.g. reading the biography of one’s Confirmation namesake or the patron saint of one’s profession, or books on spirituality and the spiritual life. Ash Wednesday, all Fridays, and all Saturdays: fasting and total abstinence. This means 3 meatless meals – with the two smaller meals not equalling in size the main meal of the day – and no snacking. Mondays, Tuesdays, Wednesdays (except Ash Wednesday), and Thursdays: fasting and partial abstinence from meat. This means three meals – with the two smaller meals not equalling in size the main meal of the day – and no snacking, but meat can be eaten at the principal meal. On days of fasting and abstinence, meatless soup is traditional. As to special Lenten foods, vegetables, seafoods, salads, pastas, and beans mark the Season, in addition to the meatless soups. The fasting of this time once even precluded the eating of eggs and fats hence Shrove Tuesday when all such products were used up. ASH WEDNESDAY IS THIS Wednesday, March 1st, Mass will be offered at 0830. Ash Wednesday, a day of fasting, is the first day of Lent in Western Christianity. It occurs 46 days (40 fasting days, if the six Sundays, which are not days of fast, are excluded) before Easter. According to the canonical gospels of Matthew, Mark and Luke, Jesus Christ spent 40 days fasting in the desert, where he endured temptation by Satan. Lent originated as a mirroring of this, fasting 40 days as preparation for Easter. Every Sunday is understood as a commemoration of the Sunday of Christ’s resurrection and thus a feast day when fasting is inappropriate. Accordingly, Christians in the Western tradition fast from Monday to Saturday (six days) during six weeks and from Wednesday to Saturday (four days) in the preceding week, thus making up the number of 40 days. Ash Wednesday derives its name from the practice of blessing ashes made from palm branches blessed on the previous year’s Palm Sunday, and placing them on the heads of participants to the accompaniment of the words “Remember man that you are dust, and to dust you shall return”. SHROVE TUESDAY popularly known as “Pancake Day” an opportunity to support our “Cherubs” apostolate by joining in the fun at The Mad Hatter Inn, Rock Street (Kemptown) in a “Pancake tossing competition”! On Tuesday 28 Feb from 8pm come along and have a go at tossing pancakes and see how many you can toss without losing one, higher than your head in five minutes! LUNCHTIME RECITALS Every Wednesday at St Nicholas’ Church, Dyke Road 12:30pm lasting for half an hour. A minimum donation of £3.00 towards recital expenses is appreciated. The recitals provide a perfect break for you to have your lunch and relax before heading back to work. Please bring your own sandwiches. Tea and Coffee is available for a donation. 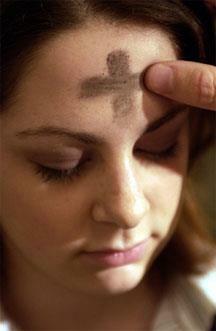 “ASHES TO GO” Churchill Square 2-3pm on Ash Wednesday. 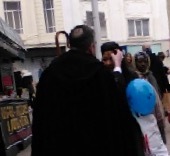 A great opportunity to explain to people “the reason for the season” and share the Gospel of Redemption. This year and to remind ourselves and others that part of the traditional observance of Lent includes acts of mercy and almsgiving, we will combine our witness with a charity collection for the homeless, specifically for “The Hub” we partner with the Salvation Army. We will position ourselves in the usual place outside the Prince of Wales pub on the western corner of Churchill Square… remember to wrap up warm! LENT DISCUSSION “Caritas” the ecumenical discussion group will be held from 7.30pm, on Thursdays in Lent beginning THIS Thursday March 2nd also in the Chapel. An opportunity once again to meet other Christians and share and discuss thoughts and life stories around the study of Biblical themes concerning discipleship. Please feel free to invite anyone you know may be interested in either or both of these events and don’t forget to put them in your diary! Due to Fr Jerome’s planned absence there will not be meetings on Thursdays the 9th and 16th of March. SASWE Concert of Music – The Salvation Army Symphonic Wind Ensemble, THIS Saturday 4th March from 7.00 p.m. supported by Community Choir All Aloud. Tickets on the door £5 – under 16’s FREE. QUIZ & FISH SUPPER on Saturday March 11 at Brighton Congress Hall hosted by the Salvation Army an opportunity to join other Christians for an informal evening with food and fellowship. Teams of six persons – don’t worry, people will be put together to form a team(/s)! Sausages are available as an alternative to fish! Tickets are £10 including supper. Telephone 01273 607095 to register your team or express interest! CAMEO LUNCH for senior citizens Thursday 30 March at The Mad Hatter Inn, Rock Street (Kemptown) our monthly lunch supporting the work of our apostolate “Cherubs Kitchen“. A very reasonable “prix fixe” set menu of homemade traditional dishes with the opportunity to meet other people of a similar age! “We had a most beautiful lunch laid for us in the Snug, a red tablecloth, beside a log fire. I wish I could describe the homemade fish pie, freshly made & cooked by our chef, Fr Jerome. It was absolutely delicious. We all had two helpings each! So wish I’d taken a picture, but I had the honour of being “mum” and forgot.” Contact Shirley to reserve a place on 07773 991670. THE HUB HOMELESS DROP-IN We’ve created a welcoming environment for our guests and serve them with dignity and respect and so we are seeking volunteers willing to serve at table and help us create a welcoming café like environment every Wednesday. We also need help in the kitchen too for, as the suburban proverb says, “many hands make light work” and we’d like to lighten the load of existing volunteers by having enough people to have a roster! That way everyone can enjoy giving of their time and not feel overly burdened or committed! We need volunteers anytime between 0830 and 1400 for all or a couple of hours, we’d be grateful for any time you can give! If you’d like to join our existing team of faithful volunteers and help us serve the most needy and often deserving of humanity struggling to get by without the security that most of us enjoy with a roof over our heads… please text/phone Fr Jerome on 07423 074517 or just turn up on a Wednesday!